More than 30 million objects are stored behind the scenes at the Field Museum. A new exhibition addresses how scientists from all over the world are using the vast collections to make new discoveries. Phil Ponce: A visit to the Field Museum can be overwhelming, with thousands of objects, from the very large to the very small on display. New things to fossils that are hundreds of millions of years old. But for all that there is to see, it’s actually less than 1 percent of the Field Museum’s collection. More than 30 million objects are stored away behind the scenes. But just because those objects may rarely or never be seen by the public doesn’t mean they are not being used. Bill Simpson: There are two sides to Field Museum. There’s this wonderful exhibit side that our public gets to come and see, but there’s another whole, cutting-edge research institution that the public generally isn’t aware about. 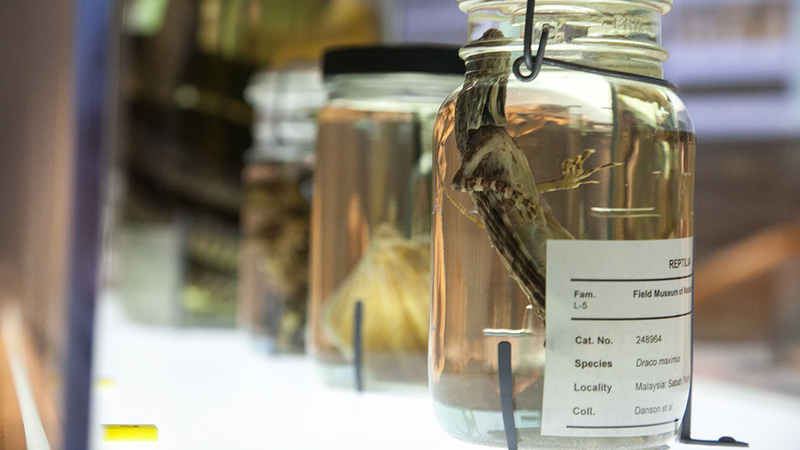 Ponce: A new exhibition called “Specimens: Unlocking the Secrets of Life” aims to give people a glimpse behind the curtain and a sense of how scientists from all over the world are using the Field’s collections to make new discoveries. Marie Georg: Most of our visitors don’t have any idea of all the things we have going on behind the scenes. They don’t realize that we have scientists in this building who work every day to study these specimens. So the exhibition shows first that we have these specimens, what kinds of things there are and then what we are doing with them, why we have so many and what our scientists are learning from them. Ponce: One of the themes of the exhibit is how new scientific techniques – from scanning and imaging technology to new methods of chemical analysis – are allowing scientists to learn new things from old specimens and artifacts. Managing the collection, ensuring items are available for researchers to study and keeping track of any specimens that have been loaned out is a hugely important job. Simpson: We call ourselves “collection managers” – but really we’re librarians but instead of books it’s in my case fossils that I’m taking care of physically, organizing the data. At any one time I’ve got thousands of vertebrae fossils on loan to paleontologists all over the world. Ponce: One recent mystery the museum’s collection helped solve was the origin of the Canada geese that brought down U.S. Airways Flight 1549 – otherwise known as the Miracle on the Hudson. Georg: They took samples of the feathers that were remaining in the engines and they used museum collections including many specimens from the Field Museum to compare the chemical signatures in the feathers. And because our specimens are labelled with where they came from we could see that the match was to specimens in Canada and not New York. Ponce: Other items in the exhibit include a giant clamshell and the fossilized remains of a Tully Monster. You can also learn about the anatomy and biology of an ancient insect trapped in amber through an interactive display based on micro-CT scans. An example of how modern technology is being used to extract new insights from old objects. The museum’s collection of gulls has also been used to show how mercury levels in the oceans are on the rise. Simpson: One of the things that a large collection can you do is help you document change. So we may go to a spot on Earth and see what’s alive there now but because of Field Museum’s encyclopedic collections we can go back a hundred years and see what was alive there back then and we can see how things have changed. Ponce: One of the most important ideas the exhibit organizers hope to convey is that collections like these are incredible resources for current and future generations. Georg: The really important thing for people to understand is there is often this big delay between when something is collected and when it reveals something. Part of science is just learning; trying to see what’s out there in nature, what’s going on and you are not necessarily going to get that impact that relevance the next day. But because we’ve been collecting these things for over a hundred years someday that information will be there for us. It’s like a time capsule from the time and place that it came from. The exhibition “Specimens: Unlocking the Secrets of Life” is on view at the Field Museum through Jan. 7, 2018. For more details, visit the museum’s website. Oct. 14, 2016: Thanks to an inquisitive Field Museum researcher, a nearly 40-million-year-old fossil housed at the institution has been identified as one of the earliest relatives of dogs, bears and foxes known as a beardog. April 4, 2016: Nearly 60 years ago, an amateur fossil collector named Francis Tully stumbled upon an incredibly peculiar fossil. The odd jumble of physical attributes looked like they would be more at home in a Dr. Seuss book than in the swamps of Illinois. Dec. 2, 2015: More images are now available on the museum’s website, but exactly what good are they to the public?